David L. Cohen; Florida Gov. Rick Scott; Cesar Conde; Russell Benford and Larry Williams at the groundbreaking ceremony of the new state of the art global headquarters of Telemundo in west Miami-Dade. 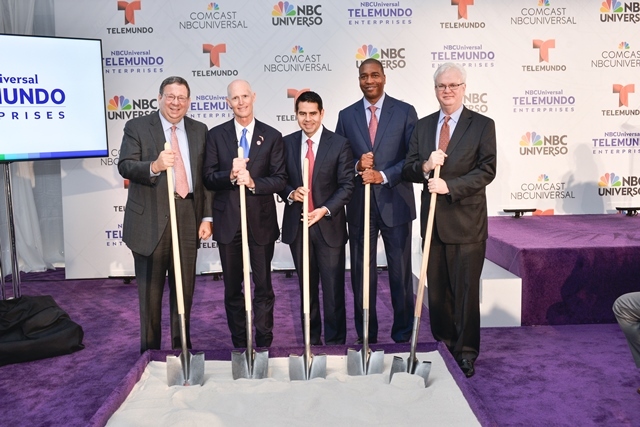 (Miami, FL – Feb. 10, 2016) – The Beacon Council congratulates NBCUniversal Telemundo Enterprises’ on its decision to make Miami-Dade the site for its new global headquarters, adding 150 new jobs and investing more than $250 million. The Beacon Council worked with the company for three years evaluating potential sites and negotiating a $3 million Miami-Dade County Targeted Jobs Incentive Fund (TJIF) package in cooperation with Enterprise Florida, Governor Rick Scott’s office and Miami-Dade County. The TJIF is paid out over 6 years based on job creation and investment commitments made by the company. The TJIF is a performance based incentive; no tax refunds will be released until job and investment project commitments have been verified. The State of Florida also approved a $5.5M High Impact Performance Incentive (HIPI) and a Capital Investment Tax Credit (CITC). NBCUniversal and parent company Comcast is building the division’s new global headquarters and bringing all of the division’s offices, broadcast and production operations under one roof including the Telemundo Network, Telemundo Studios and Telemundo International, as well as its cable network NBC UNIVERSO, its digital media operations, and NBCUniversal International’s Latin American headquarters. Equipped with the latest production technology, the new headquarters will be an advanced television production facility. From its new global headquarters, NBCUniversal Telemundo Enterprises will be poised to provide more compelling Spanish-language programming and multiplatform connections to the growing US Hispanic market and audiences around the world. The headquarters will initially house 1,100 employees, with the capacity to expand to approximately 1,300 employees. The company held a groundbreaking ceremony at the site on the corner of NW 25 Street and Northwest 121st Court on Feb. 9.